Bangladesh has made notable progress in reducing the practice of open defecation, from 34 percent in 1990 to just 1 percent of the national population in 2015. However, according to the report of the Joint Monitoring Program (JMP) 2015, the current prevalence of improved sanitation is 61 percent, mounting at only 1.1 percent annually. Good sanitation is vital for good health and for wealth creation as well. Hygienic latrines are considered the next generation of toilets, fully confining waste from both the user and the surrounding environment. Many households in the rural areas of Bangladesh don’t have sufficient cash in hand to upgrade sanitation systems, but can afford the cost if they are able to spread the cost over time. In the backdrop of prevailing high rate of unhygienic toilet which is about 65%, PKSF has decided to adjust a demand led strategy for promoting expansion of hygienic toilets by using lending instrument. However, grant instrument may be required for the ultra-poor households in this regard. 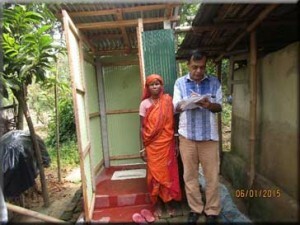 Under the OBA Sanitation Microfinance Project, hygienic latrines will be constructed for 170,000 poor households in rural Bangladesh, benefitting 850,000 individuals. Based on the existing customer base of the PKSF-POs, approximately 90 percent of the borrowers are expected to be women. (a) 170,000 poor households have received sanitation loans from MFIs under the project. (b) 850,000 people have been provided with access to hygienic sanitation facilities. The total fund of the project is US$ 25 million. Of this, US$ 3million will be provided by the World Bank and the rest US$ 22 million will be financed by PKSF and its Partner Organizations (POs). The component will provide US$2.4m subsidies to improve access to on-site sanitation for a total of approximately 170,000 low-income households, benefitting 850,000 people in rural areas. The one-off OBA subsidy will be available for household loans for low-cost technologies pricing between BDT 3500 and BDT 10,000. The OBA subsidy will range from 10 to 12.5 percent of the total value of loan to be disbursed upon independent verification outputs. This component will finance the operational and implementation related costs of the project. These latrines are being constructed on a small piece of land, at a low cost and are poor people friendly. The PKSF-POs are working all over Bangladesh. 21 POs were selected based on geographical context, previous working experience in sanitation projects and their implementing capacity. The project working areas have been selected in considering the geographic variations e.g., plain land, hilly areas, islands, char areas and low land areas etc. 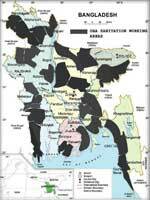 At present, the project is being implemented in 273 Upazilas or Sub-districts of 41 districts in Bangladesh through 1365 branch offices of 21 POs. 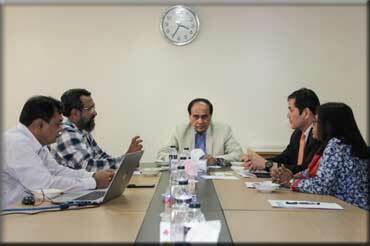 PKSF has formed a Project Management Unit (PMU) consisting of senior management level officials and two consultants. Among them, one Deputy General Manager (DGM) and one manager from PKSF are fully engaged in this project. The DGM is designated as the Project Focal Person and the Manager as Deputy Project Focal Person to oversee the overall implementation. Also eight panel leaders and 17 dealing officers from PKSF are indirectly/partly involved in this project. The Executive Directors/Chief Executive Officers of the POs are directly/partly involved in the field level implementation. Furthermore, 21 Focal Persons and relevant Area Managers and Branch Managers of the PKSF’s POs (1365 Branch Managers and 4620 Loan/Credit Officers) are actively involved in this project for the field level operations. 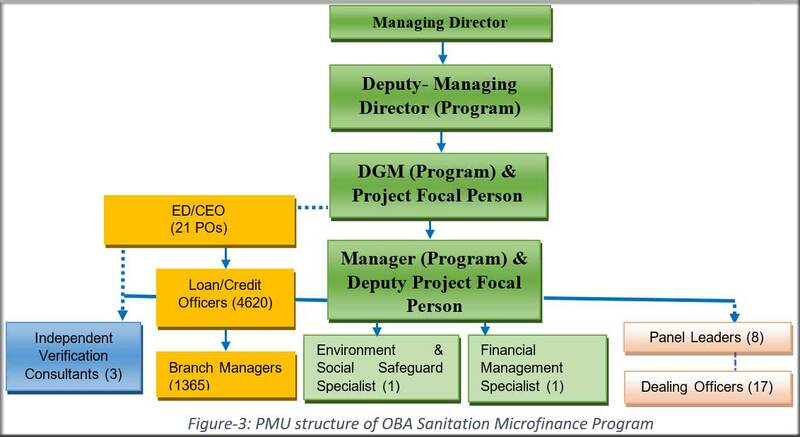 So, at present, a total of 6,270 field level staff of the PKSF’s POs are actively involved in the implementation of OBA sanitation Microfinance Program. The project was declared effective from 23 February 2017. Up to October 2017, PKSF has disbursed Sanitation Development Loan (SDL) of about US$ 2.82 million (BDT.22 crore) to 20 Partner Organizations. A total of BDT 22.15 crore was disbursed by PKSF-POs as loan finance among 22,348 households as of October 2017 and hygienic latrines installed in accordance with the World Bank latrine catalogue. Moreover, to meet the requirements of project developed Environment and Social Management Framework (ESMF) and the Small Ethnic Communities and Vulnerable People Development Framework (SECVPDF) in the field, three workshops on Environment and Social Safeguards were organized and facilitated by the Project Management Unit (PMU) of Palli Karma-Sahayak Foundation (PKSF) from 21 September 2017 to 05 October 2017 at PKSF Bhaban, room no. 306, consisting participants of PKSF-POs focal person, PKSF dealing officers, PKSF-POs area managers/zonal managers/credit coordinators and PMU staff. 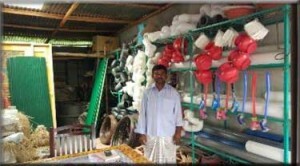 PKSF is implementing the OBA Sanitation Microfinance Program Project with the technical assistance of the World Bank. The project is implemented in 238 sub-districts (Upazilas) under 43 districts by PKSF’s 21 Partner Organizations (POs) through 1389 branch offices. The total value of the project is US$25 million. PKSF and its POs are funding US$ 22 million and the World Bank has committed a grant support of US$ 3 million to PKSF as an interest subsidy for monitoring and implementation and management of the project. The project was declared effective from 23 February 2017 and will close at the end of June 2018. Takuya Kamata, Practice Manager of Water Global Practice, World Bank visited Bangladesh and had a meeting with Managing Director of PKSF, Deputy Managing Director (Program), Project Focal Person of PKSF and Ms. Rokeya Ahmed, Task Team Leader of World Bank on 13th may, 2018 over the financing of a new IDA funding project while the meeting was presided by the Managing Director of PKSF. 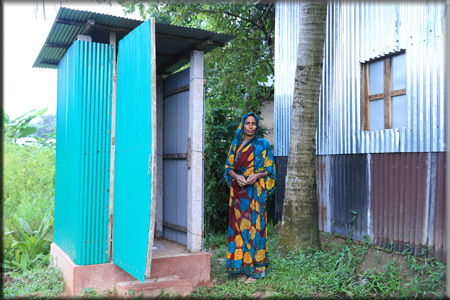 Under the OBA Sanitation Microfinance Project, it is targeted that 170,000 of hygienic latrines will be installed for poor households in rural Bangladesh, benefitting about 850,000 individuals. Based on the existing customer need of the POs, approximately 90 percent of borrowers are expected to be women. PKSF board has approved a new loan product named Sanitation Development Loan (SDL) as a regular loan instrument, which will be used to implement the OBA Sanitation Microfinance Program Project. The project is financing to the low-income households to improve access to on-site sanitation, which meet hygienic sanitation standards. 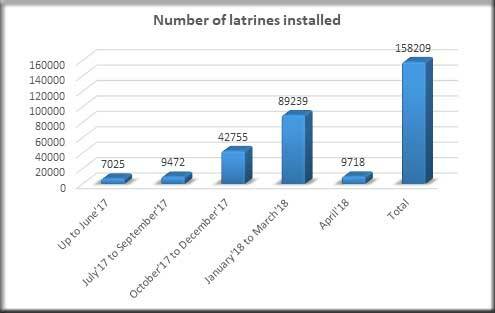 In line with this, up to April 2018, a total of 1, 58,209 hygienic household latrines have been installed with a total SDL finance of BDT 155, 84, 00600 (US$19.88 million) in the field. The diagram shows the rural households’ latrine constructions progress trend on quarterly basis. Figure 1: A scenario of Latrine constructions and loan disbursement among the households. Up to April, 2018, total 1637 Local Entrepreneurs (LEs) have received training conducted by the World Bank Technical Assistance (TA) team on the construction of hygienic latrines as per approved training manual. Now, altogether 2,372 LEs are available in the working area of OBA Sanitation Micro Finance Program Project. Out of total 2372 LEs, 1570 LEs are actively involved with the project activities. Total 981 LEs out of 2,372, have received loan amount of BDT 105.75 million (US$1.35 million) from POs for expansion of their business. Now, majority of them are able to provide better service through skilled masons and carpenters along with a one stop shop where all materials for latrines construction including pit, platform and superstructure are available. During February 10-15, 2018, the World Bank team carried out an Implementation Support Review Mission of the OBA Sanitation Microfinance Program’ Project. The mission provided an Aide Memoire (AM) which summarized the findings on the status of the project implementation, recommendations and agreements reached to take corrective measures and/or to expedite implementation. The mission met with PKSF, Financial Institute Department (FID), and three Partner Organizations (POs) ASA, YPSA and Prottayshi in their respective hub offices. The mission visited the fields of YPSA and Prottayshi in Chittagong from 11-12 February 2018. A wrap-up meeting was held on 13 February 2018 at FID chaired by the additional secretary, Ministry of Finance, People’s Republic of Bangladesh.